Where has the week gone?! Another Thanksgiving under our belts and my holiday break is almost over. Back to work on Monday for me. It has been an excellent week. It started out well with a trip to the Denver Museum of Nature and Science with my husband and son (see last week’s post), and I think it will end with a trip to the theater to see Catching Fire. I read the Hunger Games series a few years ago, and I loved the books. I don’t usually get into that kind of fiction, but those books were not a problem for me to read. Thanksgiving was an excellent day. Although I wasn’t able to be with my extended family as they all live in Ohio, I did spend the day with my husband, daughter, son, and…drum roll please…ex-husband. My ex-husband did the cooking this year and he put on an excellent feast. Many people sort of look at me strangely when I say I spend the holiday with my ex-husband. Many of my friends would rather cut off a foot than do something like that. But we started sharing holidays in this way right from the start, and it has been that way ever since. It was difficult and odd at first, but we both came to realize that it was what the kids wanted and what was best for them. I would do anything for my children, as I am sure any parent would, so that’s how our holidays go. I’ve tried including my husband’s ex in our holiday celebrations as well, and sometimes it works out and sometimes she has other plans, but the main thing is…it’s all about what the kids want. As my daughter said on Thanksgiving, “We are one big happy dysfunctional family.” And, which family isn’t? 🙂 Christmas will be my turn to cook. There was no Black Friday shopping for me. I’ve done it before with friends and it was fun, but I really hate crowds. And, I am one of those people who doesn’t go all out with Christmas presents anymore. Our children are grown and the only thing that seems to be on their wish lists is money. So I am planning on going out a little tomorrow to get each one a “token” gift, and the rest of their Christmas present will be money for gas for their cars or whatever they choose to do with it. We did go into Toys R Us a few weeks ago to pick up small gifts for our grandbabies, but they usually get money for their savings accounts as well. I spent Friday cleaning out my basement so I could get to the closet that houses my Christmas decorations. Today, decorating is on the agenda. The door to the closet was blocked by a lot of my teaching stuff that I brought home this past spring. It is amazing the “stuff” one accumulates after 17 years of teaching. I have a car loaded with books that are going to Goodwill today. I’ve worked hard over the past 17 years as was evidenced by the sheer number of lesson plans, novel units, you name it, that I had created and put into the recycle bin yesterday. Over 1 million trees were probably killed during my tenure of teaching. 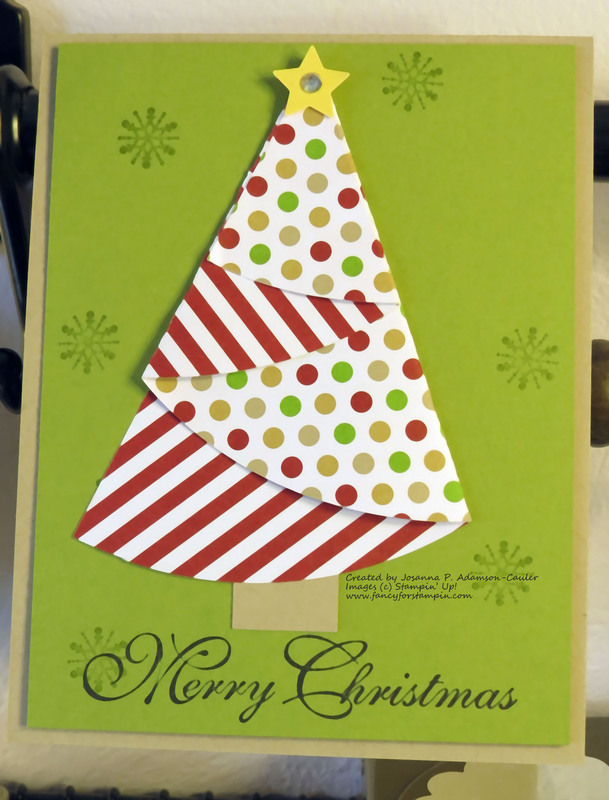 I am sharing a quick and easy card today. It won’t take much time to create. That’s one of the things I like most about it. 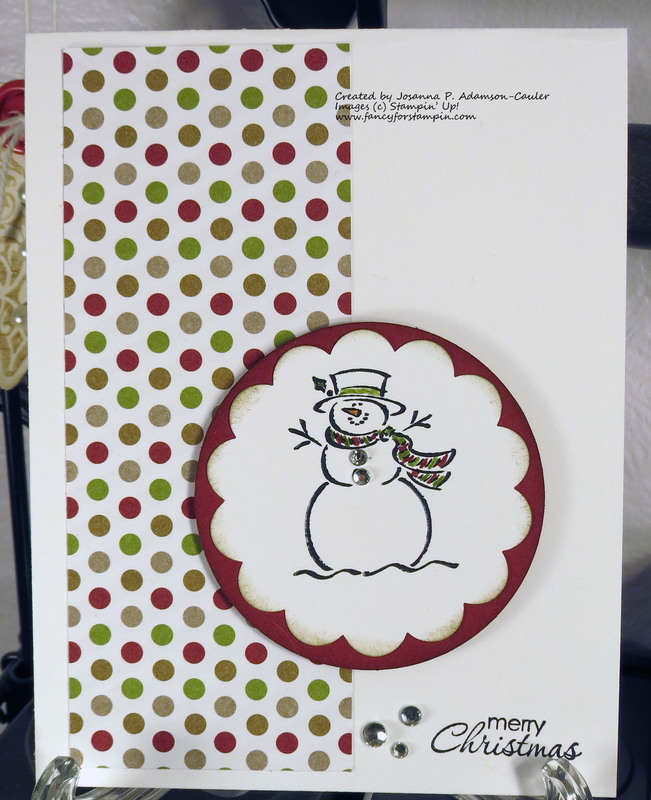 I used the Best of Snow (134387) stamp set. Just a quick post today, as I have this week off from work for the Thanksgiving holiday. 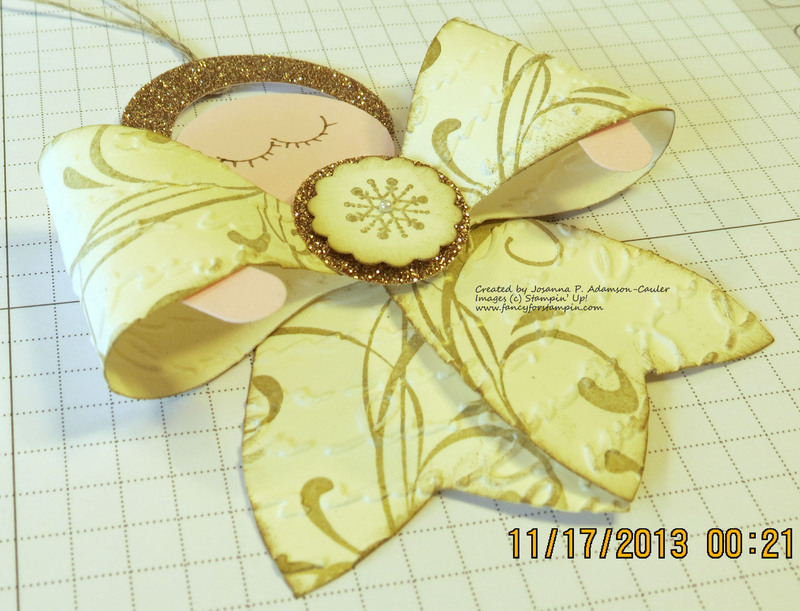 I am sharing a card that I made with the left overs from November’s My Paper Pumpkin kit. 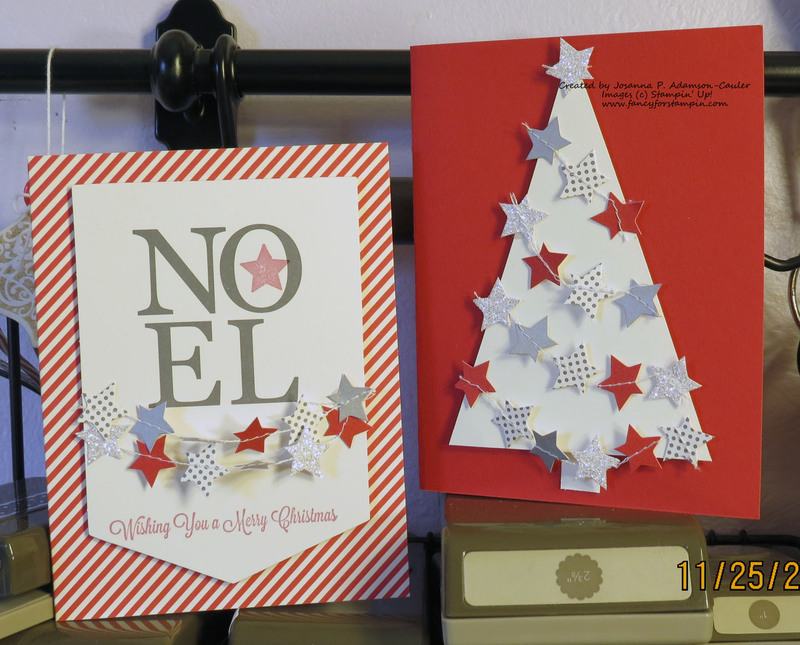 I had quite a bit of the star garland left and I didn’t want to throw it away, so I thought…”Why not make a quick little Christmas tree card. This is what I came up with. I used the same colors that coordinated with the Noel card kit. Today was an awesome day. I got to spend it with two of my favorite men; my husband and my son. We spent the day in Denver at the Museum of Nature and Science. There is a special Myth Busters display in the museum this month. When I got the flyer in the mail a few weeks ago, I knew immediately it would be something my 25-year-old “baby” would love to do. He watches Myth Busters on television all the time. I was right! Although most of the displays/experiments were probably geared toward a younger child, the three of us had fun trying to dodge a bullet, hang from a ledge, pull a table-cloth from a table without having the dishes crash to the floor, and driving blind. I even managed to flip a slice of toast and have it land on the floor butter side up three out of four times! LOL! Besides, it was a great way to spend time with my son, and since my husband’s heart surgery he has been cooped up in the house. It was a great way to get him to forget about his issues for a while. 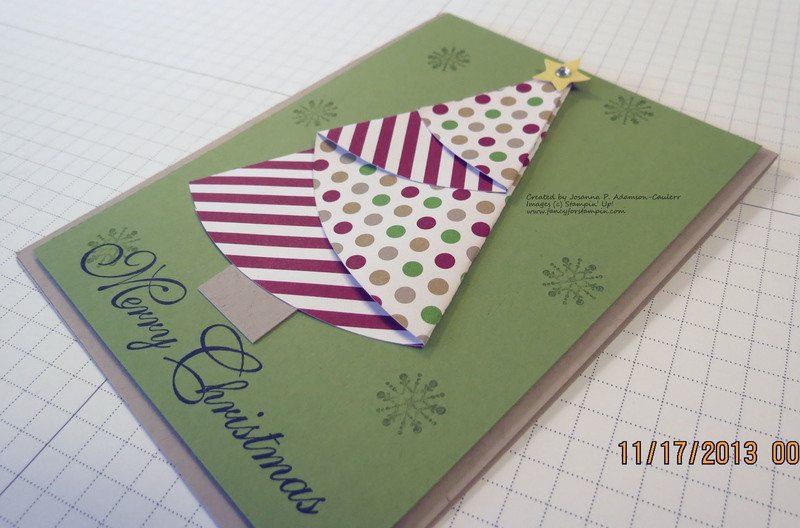 This evening I am sharing a quick and easy Christmas tree card that is made with half a six-inch circle. You’ve probably seen it elsewhere, but here it is again. The hardest part is cutting out the circle. You don’t have to use such a large circle; just keep in mind the smaller the circle, the smaller the tree. Here is the finished product along with a few photos to show you what you need to do. 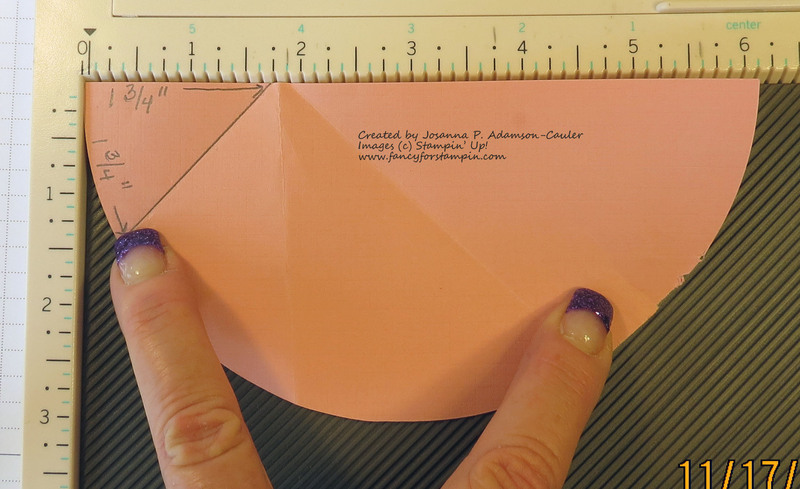 Start with a circle that is six inches in diameter (across). 3. Place the Simply Scored Diagonal Plate on top of your Simply Scored Scoring Tool. 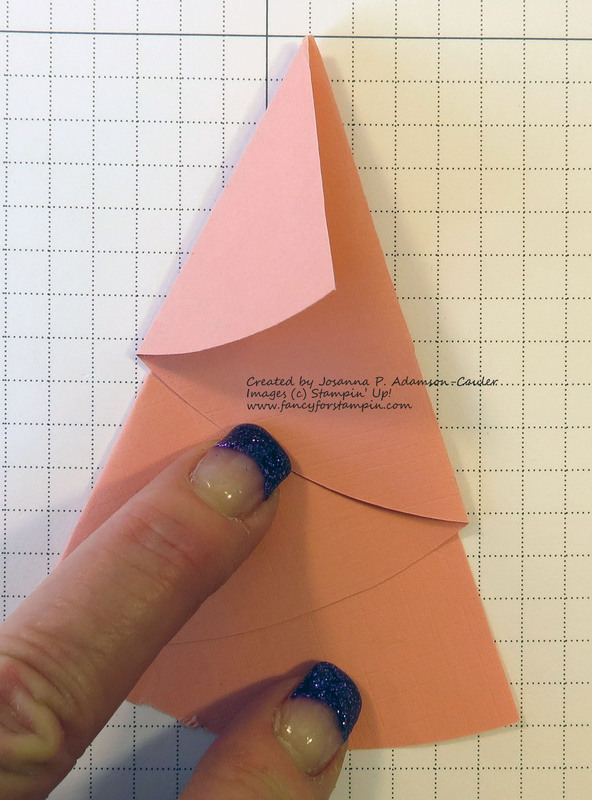 Place the half-circle on top with the straight edge of the half-circle at the top. 5. 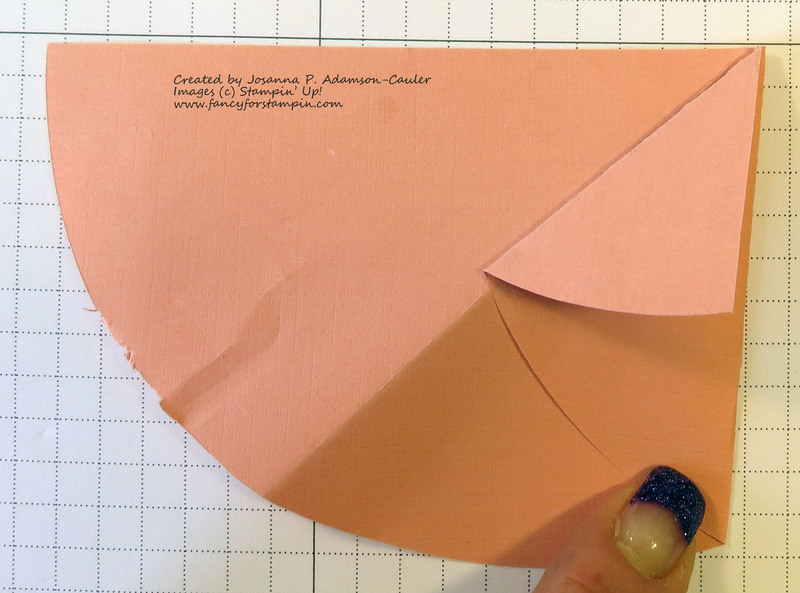 Flip the half-circle (next photo) so that the unfolded portion is on the left. 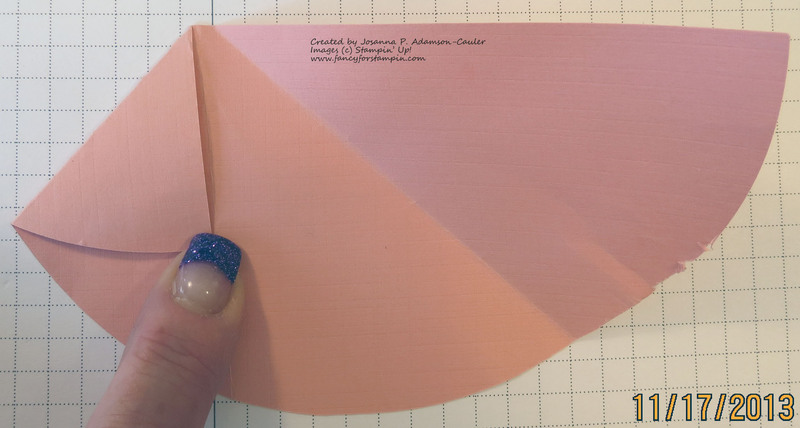 Fold the half-circle again. 6. 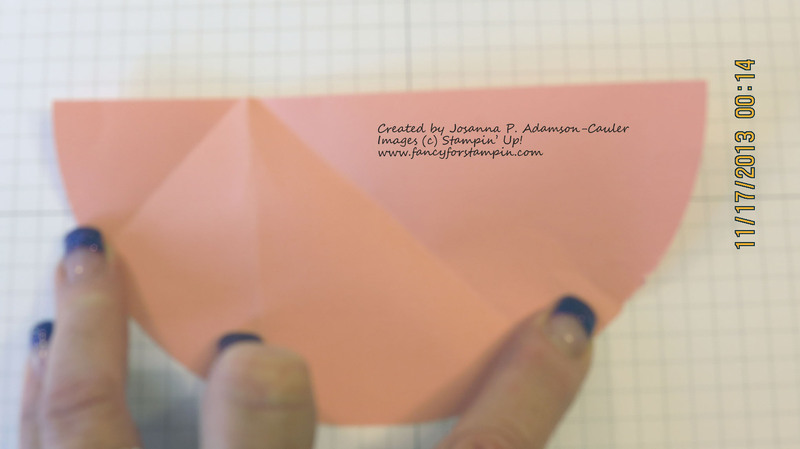 Flip the half-circle again and fold. Your tree is done! Hello, hello! Hope all is well with everyone. The weekend has flown by, and I find myself wondering where it has gone. I am looking forward to the day, (only 6 more months) when every day will be like a weekend! You may have already seen elsewhere what I am about to show you. 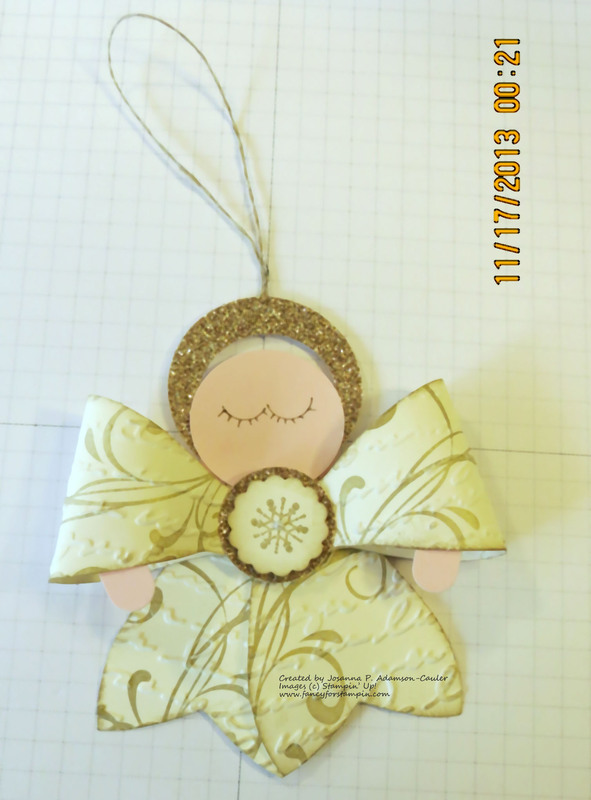 It is an angel ornament made using the Bigz Bow Die. Someone had mentioned the thought of making an angel using this die and I looked for a video on You Tube and found one. I clicked on the first link I found, and it was a video posted by Tanya Bell from Australia, who said she got the idea from somewhere else. I wish I had come up with this idea all on my own. Her website is stampingt.com.au if you want to visit it or the link for the You Tube video is here at http://www.youtube.com/watch?v=L1V168XIh4o. Any way, here are the photos of what I made. Here’s what I used on this little cutie!